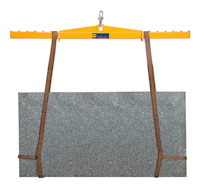 The Abaco Spreader Beam M2 has a convenient and effective design where straps can easily be hooked onto the bar at each designated slot for moving large slabs or a bundle of slabs easily and safely. It is ideal for loading and unloading containers. The Beam comes with six preset belt spaces with labels of Working Load Limit clearly displayed on the beam making it safe and easy for all users.